I remember the first time I visited the Utah desert. Mom and I were traveling to Georgia for my new job as a flight attendant and decided to make a road trip out of it. We arrived in Moab on our second day, and as we drove up the switchback road to the Arches plateau, I struggled to absorb the magnificence of the landscape. Every visit since reminds me of my first experience. I turn to deeply philosophical questions about the passage of time, the ability to survive in some of the planet’s harshest conditions, and, of course, our place among it all. If Utah’s deserts are the hype of articles and travel blogs, Utah’s slot canyons are the literal hidden gems, with miles of water-swept cavities and aggressively contoured walls reaching, sometimes, 200 to 300 meters toward the sapphire sky above. 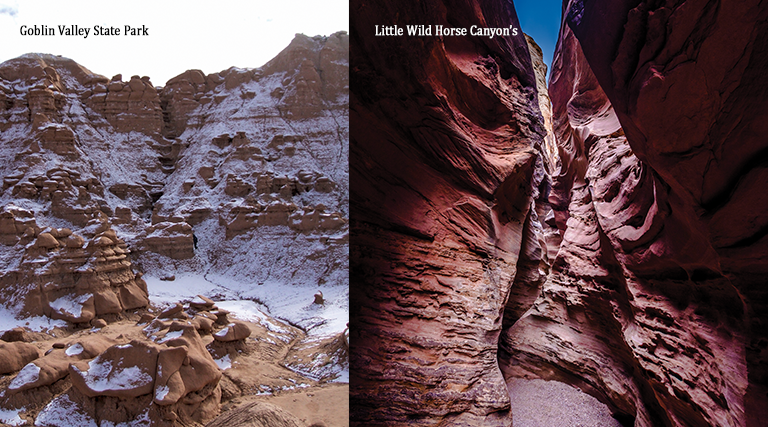 With summer temperatures in the triple digits, visiting Southern Utah in the moderate winter months offers more opportunity to explore these bucket-list worthy slot canyons. Discovering a slot canyon feels a lot like capturing magic. For history, chockstones (boulders wedged in the crack), and red, orange, and maroon sandstone, head to Moonshine Wash in the San Rafael Swell, the closest non-technical slot on this list to Salt Lake City. Moonshine Wash, just 25 miles south of Green River earned its name after locals stored illegal beverages within the canyon walls during Prohibition. Cairns lead the way to the beginning of the slot and dogs are welcome—although, booties and a harness are advised for maneuvering the steeper chockstone drops. As the crow flies, Little Wild Horse Canyon deepens about 50 miles west of Moonshine, but by car it’s roughly a two-hour drive. Dimpled sandstone and layered strata walls push in and out of the narrow riverbed of the canyon, only 5 miles from Goblin Valley State Park. Hikers will scramble over and under moderate chockstones along this short 1.8-mile hike, which can connect to Bells Canyon for a longer, more scenic 11-mile hike. Further south, in Grand Staircase-Escalante National Monument, sandy and rocky riverbeds ground the hueco-filled narrows of Little Death Hollow. There are two Death Hollow canyons in Escalante, the shorter of the two being Little Death Hollow at 4 miles. Little Death Hollow can be combined with Wolverine Canyon and Little Brown Bench for an extensive, 26-mile backpacking loop which travels down to the Escalante River and back. Roughly two and a half hours from Little Death Hollow, across red dirt roads (and a brief stint on Utah State Route 12), white paintbrush strokes wind along the walls of Zebra Slot Canyon, a short and narrow channel near Escalante. The trail is easy to lose in Harris Wash, so a map and compass secure a straightforward adventure. Use caution as water levels can wax and wane in Zebra, sometimes reaching up to stomach level. Just 20 miles down the road from Zebra slot canyon, a 3.5-mile two-for-one slot canyon hike exists with moderate obstacles and a few tight squeezes. 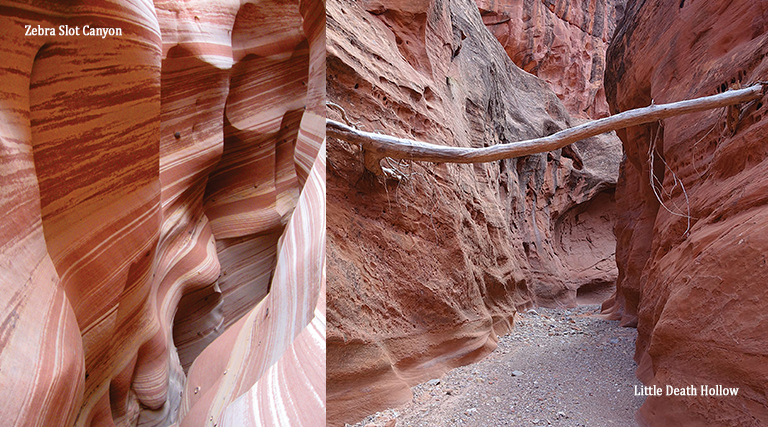 When traveling up Peek-a-Boo Canyon and down Spooky Gulch, hikers will encounter fewer obstacles for a three-hour trip. 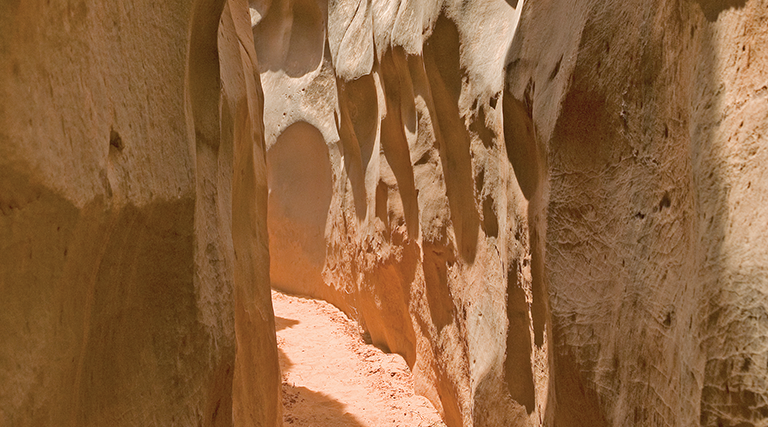 One of the more notable aspects of the Peek-a-Boo trail are the sandstone arches within the slot. You’ll feel like you’ve entered a labyrinth. Near the Arizona/Utah border are two stunning and notable slot canyons to round out this list: Buckskin Gulch and Wire Pass Slot Canyon. If you can only make it to one slot canyon, choose Buckskin Gulch–the longest and deepest known slot canyon in the world. At 21 miles, an entire day is required to hike this canyon point-to-point or bring backpacking gear for a two-day adventure. Beware of nighttime desert temps, though, which often drop below freezing. Whichever way you decide to experience this canyon, secure a permit ahead of time, and don’t forget to look up! The contours of the sandstone create a fun-house mirror effect, bending and curving into and out of one another. Finally, long walls of sandstone stretch 3.5 miles into the Wire Pass Slot Canyon. The sandy riverbed widens, narrows, and includes a short scramble about 7 to 8 feet tall–which is manageable, especially in the winter when flash floods don’t often threaten the landscape. Use stemming techniques to maneuver the drop for easier passage. 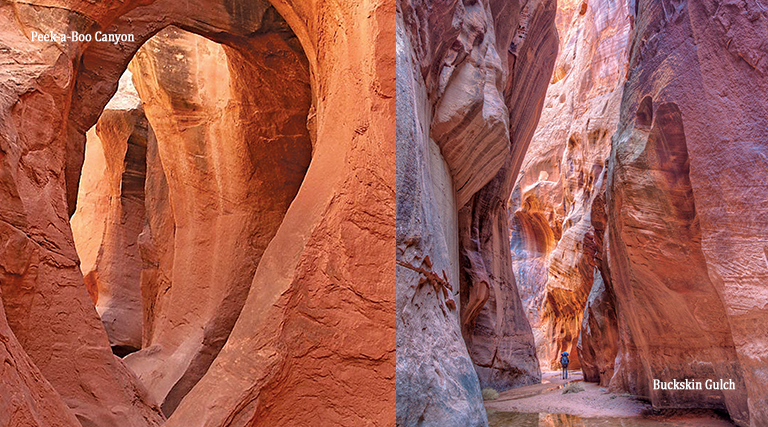 An abundance of slot canyons cleaves the Southern Utah landscape, and it’s often only a matter of finding them. So, grab a map and compass, and set off into the desert.